"Today, Heidi Heitkamp put partisan politics above the rights of law-abiding North Dakota gun owners. Right now, the U.S. Supreme Court is split 4-4 on the basic right to keep a firearm in the home for self-defense. Therefore, a vote against confirming Judge Kavanaugh to the Supreme Court is a vote against the fundamental right to self-defense,” the NRA released in a statement. The NRA has been supportive of Kavanaugh's nomination since he was nominated in July. Heitkamp announced Thursday, before Friday's cloture vote, she would vote against the nomination. Sen. Heidi Heitkamp (D-N.D.) was 12 points behind challenger Rep. Kevin Cramer (R-N.D.), according to a poll released Wednesday, the second survey in as many days showing her trailing by a double-digit margin. 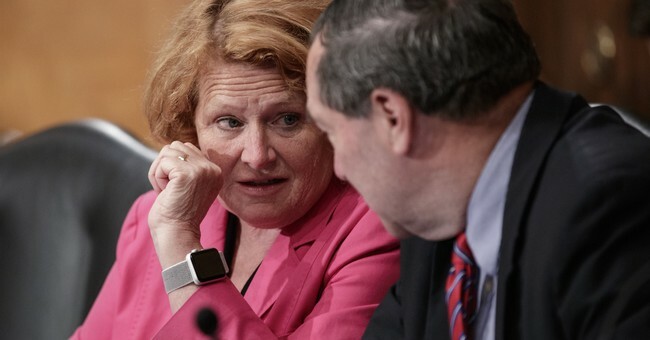 A Fox News poll showed that 53 percent of likely voters in North Dakota back Cramer, while 41 percent support Heitkamp, who is considered among the most vulnerable Democrats up for reelection. The poll showed Heitkamp's support has fallen, given a Fox News poll conducted earlier in September had showed her trailing Cramer by 44 to 48 percent.